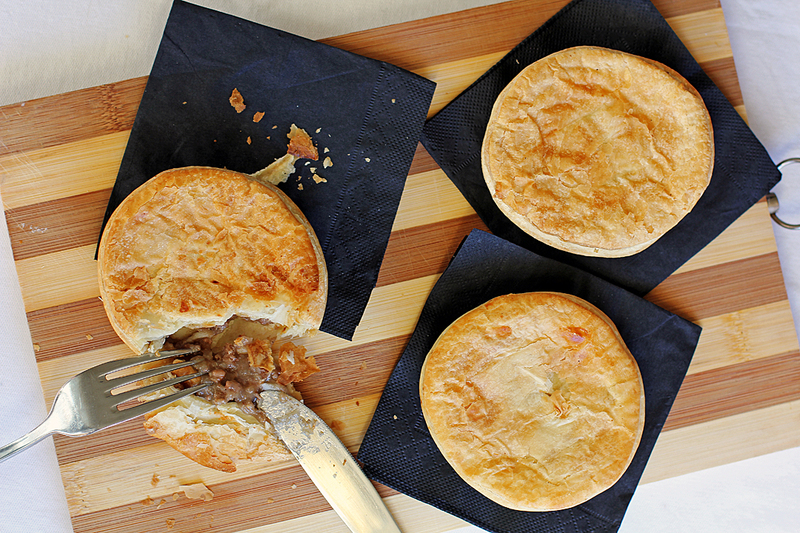 Minced beef pie is a type of a hand sized savoury pie made out of minced beef in a flaky pastry. Savoury meat pies like this are very popular here in New Zealand and in Australia and in fact it is sometimes regarded as a Kiwiana in New Zealand and in Australia it was described as “national dish” by the former New South Wales Premier Bob Carr. A dish so popular here in New Zealand, an event called Bakels New Zealand Supreme Pie Awards is held annually to give recognition to the best pie makers in New Zealand, I had seen this only on the news but from the looks of it, it is like an Oscar Awards night where bakers receive this prestigious awards in black tie. I know the sound of a meat pie will be odd to most South East Asians as the only pies we have on that region was meant to be sweet I can’t even recall an savoury pies that I had tried before, don’t worry I have the same reaction the first time I came here in New Zealand but trust me this is a very good dish. There are a lot of different flavours offered like steak, steak and cheese, mince, mince and cheese, bacon and egg, chicken and veggies and even butter chicken but for today we will be making one of the popular flavours which is the minced beef. In a large pan add butter then sauté garlic and onions until soft. Add minced beef and rosemary then cook until light brown in colour. Mix together tomato paste, Worcestershire sauce, beef stock and cornstarch. Pour into the pan and simmer in low heat for 10 minutes, add water if necessary. Season with salt and freshly ground black pepper, turn heat off then set aside. Line non-stick pie pans with prepared pastry (you can use large or small pans) then fill with minced beef mixture. Brush rims with water then cover the top with pastry sheets. Press edges to seal then brush top with beaten egg. Place in a 220C preheated oven and bake for 20-25 minutes or until golden brown in colour. Awesome pies Raymund. I love the combination of ingredients you have used. Also in Greece we eat minced beef pie! There are only small differences in the ingredients (for example we add also cheese in the mix). They look perfectly made, they puffed so nicely! Yummy! There’s a traditional dish in Braga (north of Portugal), called “Frigideiras” [literally translated into Frying Pans] which is very similar to this. Delicious! I lived in Natchitoches, Louisiana, for 5 years and the town was famous for its “Natchitoches meat pies”. Every time I go home, I try to find some. I love them! Looking at your recipe, the ingredients are very similar if not the same. I’ve never made them so I’m not sure, so I guess I’ll have to make yours and find out! 🙂 Yours look SO GOOD! Texas, where is grew up, is well known for good meat pies. Yours sounds good. This is one of those dishes I’ve never made, but I love. Meat pies aren’t as popular in the US as they are in some other parts of the world, but there sure are pockets here where they’re one of the most popular dishes going. I definitely need to try making these sometime – they have great flavor, and are so cute! Thanks for this. that crust looks so perfect and flaky! I’m a huge fan of savory handpies. I like how all the ingredients either enhance or compliment the beef flavor. Ooh I love a good beef pie – I miss them as you just can’t get the same thing here in Singapore. There was another similar recipe to this but the ingredients included beer and cheese that you made in muffin tins. I tried it and my husband and I love it. I lost the recipe during our move and I can’t find it on this site anymore. Am I missing it somewhere or can you send me the recipe? Thanks! !